LaDonna Adrian Gaines (December 31, 1948 – May 17, 2012), better known by her stage name Donna Summer, was an American singer, songwriter, and actress. She gained prominence during the disco era of the late 1970s. A five-time Grammy Award winner, Summer was the first artist to have three consecutive double albums reach No. 1 on the United States Billboard 200 chart and charted four number-one singles in the U.S. within a 12-month period. Summer has reportedly sold over 100 million records, making her one of the world's best-selling artists of all time. She also charted two number-one singles on the R&B charts in the U.S. and one number-one in the U.K.
Summer earned a total of 32 hit singles on the U.S. Billboard Hot 100 chart in her lifetime, with 14 of those reaching the top ten. She claimed a top 40 hit every year between 1975 and 1984, and from her first top ten hit in 1976, to the end of 1982, she had 12 top ten hits; (10 were top five hits) more than any other act. She returned to the Hot 100's top five in 1983, and claimed her final top ten hit in 1989 with "This Time I Know It's for Real". Her most recent Hot 100 hit came in 1999 with "I Will Go With You (Con Te Partiro)". While her fortunes on the Hot 100 waned through those decades, Summer remained a force on the U.S. Dance/Club Play Songs chart over her entire career. While influenced by the counterculture of the 1960s, Summer became the lead singer of a psychedelic rock band named Crow and moved to New York City. Joining a touring version of the musical Hair, she left New York and spent several years living, acting, and singing in Europe, where she met music producers Giorgio Moroder and Pete Bellotte. Summer returned to the U.S., in 1975 after the commercial success of the song "Love to Love You Baby", which was followed by a string of other hits, such as "I Feel Love", "Last Dance", "MacArthur Park", "Heaven Knows", "Hot Stuff", "Bad Girls", "Dim All the Lights", "No More Tears (Enough Is Enough)" (duet with Barbra Streisand), and "On the Radio". She became known as the "Queen of Disco", while her music gained a global following. Summer died on May 17, 2012, at her home in Naples, Florida. In her obituary in The Times, she was described as the "undisputed queen of the Seventies disco boom" who reached the status of "one of the world's leading female singers." Giorgio Moroder described Summer's work with him on the song "I Feel Love" as "really the start of electronic dance" music. In 2013, Summer was inducted into the Rock and Roll Hall of Fame. In December 2016, Billboard Magazine ranked her as the 6th most successful dance artist of all-time. LaDonna Adrian Gaines was born in Boston, Massachusetts, to Andrew and Mary Gaines, and was one of seven children. She was raised in the Boston neighborhood of Mission Hill. Her father was a butcher and her mother was a schoolteacher. 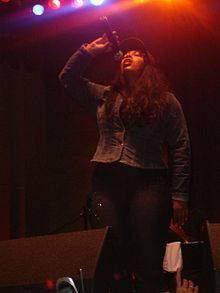 Summer's performance debut occurred at church when she was eight years old, replacing a vocalist who failed to show up. She later attended Boston's Jeremiah E. Burke High School where she performed in school musicals and was considered popular. In 1967, just weeks before graduation, Donna left for New York where she joined the blues rock band Crow. After they were passed on by a record label that was only interested in the band's lead singer, the band agreed to break up. Summer stayed in New York and auditioned for a role in the counterculture musical, Hair. She landed the part of Sheila, and agreed to take the role in the Munich production of the show, moving there after getting her parents' reluctant approval. Summer eventually became fluent in German, singing various songs in that language, and participated in the musicals Ich bin ich (the German version of The Me Nobody Knows), Godspell, and Show Boat. Within three years, she moved to Vienna, Austria, and joined the Vienna Volksoper. She briefly toured with an ensemble vocal group called FamilyTree, the creation of producer Günter "Yogi" Lauke. In 1968, Summer released (as Donna Gaines) on Polydor her first single, a German version of the title "Aquarius" from the musical Hair, followed in 1971 by a second single, a remake of the Jaynetts' 1963 hit, "Sally Go 'Round the Roses", from a one-off European deal with Decca Records. In 1969, she issued the single "If You Walkin' Alone" on Philips Records. Donna married Austrian actor Helmuth Sommer in 1973, and gave birth to their daughter (called Mimi) Natalia Pia Melanie Sommer, the same year. She provided backing vocals for producer-keyboardist Veit Marvos on his Ariola Records release Nice to See You, credited as "Gayn Pierre". Several subsequent singles included Donna performing with the group, and the name "Gayn Pierre" was used while performing in Godspell with Helmuth Sommer during 1972. While working as a model part-time and back up singer in Munich, Summer met German-based producers Giorgio Moroder and Pete Bellotte during a recording session for Three Dog Night at Musicland Studios. The trio forged a working partnership, and Donna was signed to their Oasis label in 1974. A demo tape of Summer's work with Moroder and Bellotte led to a deal with the European-distributed label Groovy Records. Due to an error on the record cover, Donna Sommer became Donna Summer; the name stuck. Summer's first album was Lady of the Night. It became a hit in the Netherlands, Sweden, Germany and Belgium on the strength of two songs, "The Hostage" and the title track "Lady of the Night". "The Hostage" reached the top of the charts in France, but was removed from radio playlists in Germany because of the song's subject matter; a high ranking politician had recently been kidnapped and held for ransom. In 1975, Summer passed on an idea for a song to Moroder who was working with another artist; a song that would be called "Love to Love You". Summer and Moroder wrote the song together, and together they worked on a demo version with Summer singing the song. Moroder decided that Summer's version should be released. Seeking an American release for the song, it was sent to Casablanca Records president Neil Bogart. Bogart played the song at one of his extravagant industry parties, where it was so popular with the crowd, they insisted that it be played over and over, each time it ended. Bogart requested that Moroder produce a longer version for discothèques. Moroder, Bellotte, and Summer returned with a 17-minute version. Bogart tweaked the title to "Love to Love You Baby", and Casablanca signed Summer, releasing the single in November 1975. The shorter 7" version of the single was promoted by radio stations, while clubs regularly played the 17 minute version (the longer version would also appear on the album). By early 1976, "Love to Love You Baby" had reached No. 2 on the U.S. Billboard Hot 100 chart and had become a Gold single, while the album had sold over a million copies. The song generated controversy due to Summer's moans and groans, and some American stations, like those in Europe with the initial release, refused to play it. Despite this, "Love to Love You Baby" found chart success in several European countries, and made the Top 5 in the United Kingdom despite the BBC ban. Casablanca wasted no time releasing the album A Love Trilogy, featuring "Try Me, I Know We Can Make It" No. 80 and Summer's remarkable rendition of Barry Manilow's "Could It Be Magic" No. 52, which was followed by Four Seasons of Love, which spawned the singles "Spring Affair" No. 58 and "Winter Melody", No. 43. Both albums went Gold. In 1977, Summer released the concept album I Remember Yesterday. The song "I Feel Love", reached No. 6 on the Hot 100 chart. and No. 1 in the UK. She received her first American Music Award nomination for Favorite Soul/R&B Female Artist. The single would attain Gold status and the album went Platinum in the U.S. Another concept album, also released in 1977, was Once Upon a Time, a double album which told of a modern-day Cinderella "rags to riches" story. This album would attain Gold status. Summer recorded the song "Down Deep Inside" as the theme song for the 1977 film The Deep. In 1978, Summer acted in the film Thank God It's Friday, the film met with modest success; the song "Last Dance", reached No. 3 on the Hot 100. The soundtrack and single both went Gold and resulted in Summer winning her first Grammy Award, for Best Female R&B Vocal Performance. Its writer, Paul Jabara, won both an Academy Award and Golden Globe Award for the composition. Summer also had "With Your Love" and "Je t'aime... moi non plus", on the soundtrack. Her version of the Jimmy Webb ballad, "MacArthur Park", became her first No. 1 hit on the Hot 100 chart. It was also the only No. 1 hit for songwriter Jimmy Webb; the single went Gold and topped the charts for three weeks. She received a Grammy nomination for Best Female Pop Vocal Performance. The song was featured on Summer's first live album, Live and More, which also became her first album to hit number one on the U.S. Billboard 200 chart and went double-Platinum, selling over 2 million copies. The week of November 11, 1978, Summer became the first female artist of the modern rock era to have the No. 1 single on the Hot 100 and album on the Billboard 200 charts, simultaneously. The song "Heaven Knows", which featured Brooklyn Dreams singer Joe "Bean" Esposito; reached No. 4 on the Hot 100 and became another Gold single. In 1979, Summer won three American Music Awards for Single, Album and Female Artist, in the Disco category at the awards held in January. Summer performed at the world-televised Music for UNICEF Concert, joining contemporaries such as ABBA, Olivia Newton-John, the Bee Gees, Andy Gibb, Rod Stewart, John Denver, Earth, Wind & Fire, Rita Coolidge and Kris Kristofferson for a TV special that raised funds and awareness for the world's children. Artists donated royalties of certain songs, some in perpetuity, to benefit the cause. Summer began work on her next project with Moroder and Bellotte, Bad Girls. Mororder brought in Harold Faltermeyer, with whom he had collaborated on the soundtrack of film Midnight Express, to be the album's arranger. Faltermeyer's role would significantly increase from arranger, as he played keyboards and wrote songs with Summer. The album went triple-Platinum, spawning the number-one hits "Hot Stuff" and "Bad Girls", that went Platinum, and the number-two "Dim All the Lights" which went Gold. The week of June 16, 1979, Summer would again have the number-one single on the Hot 100 chart, and the number-one album on the Billboard 200 chart; when "Hot Stuff" regained the top spot on the Hot 100 chart. The following week, "Bad Girls" would be on top of the U.S. Top R&B albums chart, "Hot Stuff" remained at No. 1, and "Bad Girls", the single, would climb into the top five on the Hot 100. The following week, Summer was the first solo artist to have two songs in the Hot 100 top three at the same time. In July 1979, Summer topped the Hot 100 singles chart, and the Billboard 200 albums chart, and the Soul singles chart simultaneously. In the week of November 10, 1979, "Dim All the Lights" peaked at No. 2 for two weeks; the following week "No More Tears (Enough is Enough)" would get to No. 3; and once again Summer would have two songs in the top 3, on the Hot 100. One week later, "No More Tears" climbed to No. 1 spot on the Hot 100 chart, and "Dim All the Lights" went to No. 4; she again had two songs in the top 5 of the Hot 100 chart. In the span of eight months, Summer had topped both the singles and albums charts simultaneously, three times. She became the first Female Artist to have three number-one singles in a calendar year. With "Mac Arthur Park", "Hot Stuff", "Bad Girls", and the Barbra Streisand-duet "No More Tears (Enough is Enough)", Summer achieved four number-one hits on the Hot 100 chart within a 12-month period. Including "Heaven Knows" and "Dim All the Lights" she had achieved six top 4 singles on the Hot 100 chart in the same 12-month period. Those songs, along with "Last Dance", "On the Radio", and "The Wanderer", would give her nine Top 5 singles on the Hot 100 chart in just over a two-year period. The single, "No More Tears (Enough is Enough)" would sell over 2 million copies becoming a Platinum success. "Hot Stuff" won her a Grammy Award in the Best Female Rock Vocal Performance, the first time the category was included. She was nominated for the Grammy Award for Album of the Year and both Best Female Pop Vocal Performance and Best Female R&B Vocal Performance, as well as Best Disco Recording. That year, Summer played eight sold-out nights at the Universal Amphitheater in Los Angeles. Casablanca then released On the Radio: Greatest Hits Volumes I & II, her first (international) greatest hits set, in 1979. The album was mixed differently than the original songs issued on it, with each song segueing into the next, and included two new songs "On the Radio" and "No More Tears (Enough is Enough)". It would be the first time that such an album package would be made. The album went No. 1, her third consecutive No. 1 album on the Billboard 200, and gained double-Platinum status. "On the Radio", reached No. 5, selling over a million copies in the U.S. alone, making it a Gold single. Summer would again receive a Grammy nomination for Best Female Pop Vocal Performance. Summer received four nominations for 1980 American Music Awards, and took home awards for Female Pop/Rock and Female Soul/R&B Artist; and well as Pop/Rock single for "Bad Girls". Just over a week after the awards, Donna had her own nationally televised special, The Donna Summer Special, which aired on ABC network on January 27, 1980. After the release of the On the Radio album, Summer wanted to branch out into other musical styles, which led to tensions between her and Casablanca Records. Casablanca wanted her to continue to record disco only. Summer was upset with President Neil Bogart over the early release of the single "No More Tears (Enough is Enough)"; she had penned "Dim All the Lights" alone, and was hoping for a number-one hit as a songwriter. Not waiting until "Dim All the Lights" had peaked, or at least another month as promised; Summer felt it had detracted from the singles chart momentum. Summer and the label parted ways in 1980, and she signed with Geffen Records, the new label started by David Geffen. Summer had filed a 10-million-dollar suit against Casablanca; the label counter-sued. In the end, she did not receive any money, but won the rights to her own lucrative song publishing. Summer's first Geffen album, The Wanderer, featured an eclectic mixture of sounds, bringing elements of rock, rockabilly, new wave and gospel music. The Wanderer was rushed to market. The producers of the album wanted more production time. The album continued Summer's streak of Gold albums with the title track peaking at No. 3 on the Hot 100 chart. Its follow-up singles were, "Cold Love" No.33 and "Who Do You Think You're Foolin'", No.40. Donna was nominated for Best Female Rock Vocal Performance for "Cold Love", and Best Inspirational Performance for "I Believe in Jesus" at the 1981 Grammy Awards. She would soon be working on her next album. It was to be another double album set. When David Geffen stopped by the studio for a preview, he was warned that it was a work in progress, but it was almost done. That was a mistake, because only a few tracks had been finished, and most of them were in demo phase. He heard enough to tell producers that it was not good enough; the project was canceled. It would be released years later in 1996, under the title I'm a Rainbow. Over the years, a few of the tracks would be released. The song "Highway Runner" appears on the soundtrack for the film Fast Times at Ridgemont High. "Romeo" appears on the Flashdance soundtrack. Both, "I'm a Rainbow" and "Don't Cry For Me Argentina" would be on her 1993 Anthology album. David Geffen hired top R&B and pop producer Quincy Jones to produce Summer's next album, the eponymously titled Donna Summer. The album took over six months to record as Summer, who was pregnant at the time, found it hard to sing. During the recording of the project, Neil Bogart died of cancer in May 1982 at age 39. Summer would sing at his funeral. The album included the top ten hit "Love Is in Control (Finger on the Trigger)"; for which she received a Grammy nomination for Best Female R&B Vocal Performance. Donna was also nominated for Best Female Rock Vocal Performance for "Protection", penned for her by Bruce Springsteen. Other singles included "State of Independence" (No. 41 pop) and "The Woman in Me" (No. 33 pop). Geffen Records were notified by Polygram Records who now owned Casablanca, that Donna still needed to deliver them one more album to fulfill her contract with them. Summer recorded and delivered the album She Works Hard for the Money and Polygram released it on its Mercury imprint in 1983. The title song became a major hit, reaching No. 3 on the US Hot 100, as well as No. 1 on Billboard's R&B chart for three weeks. It also garnered Summer another Grammy nomination, for Best Female Pop Vocal Performance. "Unconditional Love", which featured the British group Musical Youth, and "Love Has a Mind of Its Own" did not crack the top 40. The album itself was certified Gold, and climbed to No. 9 on the Billboard 200 chart; the highest chart position of any female artist in male-dominated 1983. The song "He's a Rebel" would win Summer her third Grammy Award, this time for Best Inspirational Performance. British director Brian Grant was hired to direct Summer's video for "She Works Hard for the Money". The video was a success, being nominated for MTV Music Video Awards for Best Female Video and Best Choreography; Summer became one of the first black artists, and the first African-American Female Artist to have her video played in heavy rotation on MTV. Grant would also be hired to direct Summer's Costa Mesa HBO concert special, A Hot Summers Night. Grant who was a fan of the song State of Independence had an idea for a grand finale. He wanted a large chorus of children to join Summer on stage at the ending of the song. His team looked for local school children in Orange County, to create a chorus of 500 students. On the final day of rehearsals, the kids turned up and they had a full rehearsal. According to Grant, "It looked and sounded amazing. It was a very emotional, very tearful experience for everyone who was there." He thought if this was that kind of reaction in rehearsal, then what an impact it would have in the concert. After the rehearsal Grant was informed that he could not use the kids because the concert would end after 10 pm; children could not be licensed to be on stage at such a late hour (California had strict child labor laws in 1983). "It's a moment that I regret immensely: a grand finale concept I came up with that couldn't be filmed in the end". When the final sequence was filmed, Summer's daughter Mimi and her family members joined her on stage for "State of Independence". In late 1984, David Geffen enlisted She Works Hard for the Money's producer Michael Omartian to produce Cats Without Claws. Summer was happy that Geffen and his executives stayed out of the studio during the recording and thanked him in the album's liner notes, but her request for the lead single would be rejected. The album failed to attain Gold status in the U.S., her first album not to do so. It was first album not to yield a top ten hit, since 1977's Once Upon a Time. The Drifters cover "There Goes My Baby" reached No. 21 and "Supernatural Love" went to No. 75. She would win another Grammy for Best Inspirational Performance for the song "Forgive Me". On January 19, 1985, she sang at the nationally televised 50th Presidential Inaugural Gala the day before the second inauguration of Ronald Reagan. In 1986, Harold Faltermeyer wrote the title song for a German ski movie called Fire and Ice, and thought Summer would be ideal to sing the song. He decided to reach out to Summer and, although she was not interested in singing the song, she was very much interested in working with Faltermeyer again. After a meeting with David Geffen he was on board with the project. Summer's main objective for the album was that it have stronger R&B influences; Faltermeyer who had just finished doing the soundtracks to Top Gun and Fletch, was after a tough FM-oriented sound. On completion, Geffen liked what he heard, but his executives did not think there were enough songs that could be deemed singles. They wanted Faltermeyer to produce "Dinner with Gershwin", but he was already busy with another project, so another producer was found. They also substituted a previous recording called "Bad Reputation", songs like "Fascination", fell by the wayside. Geffen had shared the vision of moving Summer into the R&B market as a veteran artist, but these expectations were not met. Faltermeyer, in a 2012 interview with Daeida Magazine, said, "She was an older artist by then and the label's priority may have been on the youth market. The decision was made afterward by executives who were looking for a radio hit for 1987 and not something the would perhaps last beyond then." The label's President Ed Rosenblatt would later admit: "The company never intended to focus on established superstars". The album All Systems Go, did not to achieve Gold status. The single "Dinner with Gershwin", (written by Brenda Russell), stalled at 48 in U.S., though it became a hit in the UK, peaking at No. 13. The album's title track, "All Systems Go", was released only in the UK, where it peaked at No. 54. For Summer's next album, Geffen Records hired the British hit production team of Stock Aitken Waterman (or SAW), who enjoyed incredible success writing and producing for such acts as Kylie Minogue, Bananarama, and Rick Astley, among others. The "SAW" team describe the working experience as a labour of love, and said it was their favourite album of all that they had recorded. Geffen decided not to release the album Another Place and Time, and Summer and Geffen Records parted ways in 1988. The album was released in Europe in March 1989 on Warner Bros. Records, which had been Summer's label in Europe since 1982. The single "This Time I Know It's for Real" became a top ten hit in several countries in Europe, prompting Warner Bros.' sister company, Atlantic Records, to sign Summer in the U.S. The single peaked at No. 7 on the US Hot 100 and became her 12th Gold single in America. She scored two more UK hits from the album, "I Don't Wanna Get Hurt" (UK No. 7) and "Love's About to Change My Heart" (UK No. 20). In 1989, Summer and her husband, Bruce Sudano, had been in talks to do a new kind of reality-based sitcom. It would be based on their own hectic household. At the time, they lived with their children Amanda, Brooklyn and Mimi, two sets of in-laws, and a maid. The television network started changing the premise of the show, making it less funny, says Sudano, "And because we were an interracial couple, they didn't want us to be married anymore". In 1989, this was "an issue. So with that mentality we just backed out of it." It was also during this period that Summer started to have gallery showings of her paintings. Rick Solomon, chairman of Fine Circle Art, was impressed by the brash colors and images of Summer's work. "I've been in business for 26 years," he said, "...Donna has her own style... she is no Sunday painter. Oh, some critics have felt it necessary to knock her. It's just that old thing, I suppose – not being able to accept the idea that a singer can also be a painter." In 1990, a Warner compilation, The Best of Donna Summer, was released. The album went Gold in the UK after the song "State of Independence" was re-released there to promote the album. The following year, Summer worked with producer Keith Diamond emerged with the album Mistaken Identity, which included elements of R&B as well as new jack swing. "When Love Cries" continued her success on the R&B charts, reaching No. 18. In 1992, Summer embarked on a world tour and later that year received a star on the Hollywood Walk of Fame. She reunited with Giorgio Moroder, for the song "Carry On", which was included on the 1993, Polygram issued The Donna Summer Anthology, it contained 34 tracks of Summer's material with Casablanca and Mercury Records, and from her tenures with Atlantic and Geffen. Summer signed with Mercury/Polygram that same year, and in 1994 she re-teamed with producer Michael Omartian to record a Christmas album, Christmas Spirit, which included classic Christmas songs such as "O Holy Night" and "White Christmas" and three Summer-penned songs,"Christmas is Here", "Lamb of God" and the album's title track. Summer was accompanied by the Nashville Symphony Orchestra. Another hits collection, Endless Summer: Greatest Hits, was released featuring eighteen songs. There were two new tracks "Melody of Love (Wanna Be Loved)" and "Any Way at All". In 1995, "Melody of Love (Wanna Be Loved)" went No. 1 on the US dance charts, and No. 21 in the UK. During this time, Summer had role on the sitcom Family Matters as Steve Urkel's (Jaleel White) Aunt Oona. She made a few appearances in 1997. In 1998, Summer received the first Grammy Award for Best Dance Recording, after a remixed version of her 1992 collaboration with Giorgio Moroder, "Carry On", was released in 1997. In 1999, Summer was asked to do the Divas 2 concert, but when she went in and met with the producers, it was decided that they would do Donna in concert by herself. Summer taped a live television special for VH1 titled Donna Summer – Live & More Encore, producing the second highest ratings for the network that year, after their annual Divas special. A CD of the event was released by Epic Records and featured two studio recordings, "I Will Go with You (Con te partirò)" and "Love Is the Healer", both of which reached No. 1 on the U.S. dance charts. In 2000, Summer participated in VH1's third annual Divas special, dedicated to Diana Ross, she sang the Supreme's hit Reflections, and her own material for the show. "The Power of One" is a theme song for the movie Pokémon: The Movie 2000. The dramatic ballad was produced by David Foster and dance remixes were also issued to DJs and became another dance floor success for Summer, peaking at No. 2 on the same chart in 2000. In 2003, Summer issued her autobiography, Ordinary Girl: The Journey, and released a best-of set titled The Journey: The Very Best of Donna Summer. In 2004, Summer was inducted into the Dance Music Hall of Fame as an artist, alongside the Bee Gees and Barry Gibb. Her classic song, I Feel Love, was inducted that night as well. In 2004 and 2005, Summer's success on the dance charts continued with the songs You're So Beautiful and I Got Your Love. In 2008, Summer released her first studio album of fully original material in 17 years, entitled Crayons. Released on the Sony BMG label Burgundy Records, it peaked at No. 17 on the U.S. Top 200 Album Chart, her highest placing on the chart since 1983. The songs I'm a Fire, Stamp Your Feet and Fame (The Game) all reached No. 1 on the U.S. Billboard Dance Chart. The ballad Sand on My Feet was released to adult contemporary stations and reached No. 30 on that chart. Summer said, "I wanted this album to have a lot of different directions on it. I did not want it to be any one baby. I just wanted it to be a sampler of flavors and influences from all over the world. There's a touch of this, a little smidgeon of that, a dash of something else, like when you're cooking." On July 29, 2010, Summer gave an interview with Allvoices.com wherein she was asked if she would consider doing an album of standards. She said, "I actually am, probably in September. I will begin work on a standards album. I will probably do an all-out dance album and a standards album. I'm going to do both and we will release them however we're going to release them. We are not sure which is going first." In August 2010, Summer released the single "To Paris With Love", co-written with Bruce Roberts and produced by Peter Stengaard. The single went to No. 1 on the U.S. Billboard Dance Chart in October 2010. That month, Summer also appeared on the PBS television special Hitman Returns: David Foster and Friends. In it, Summer performed with Seal on a medley of the songs "Un-Break My Heart / Crazy / On the Radio" before closing the show with "Last Dance". On September 15, 2010, Summer appeared as a guest celebrity, singing alongside contestant Prince Poppycock, on the television show America's Got Talent. On June 6, 2011, Summer was a guest judge on the show Platinum Hit, in an episode entitled "Dance Floor Royalty". In July of that same year, Summer was working at Paramount Recording Studios in Los Angeles with her nephew, the rapper and producer O'Mega Red. Together they worked on a track titled "Angel". On December 11, 2012, after four prior nominations, Summer was posthumously announced to be one of the 2013 inductees to the Rock and Roll Hall of Fame., and was inducted on April 18, 2013, at Los Angeles' Nokia Theater. A remix album titled Love To Love You Donna, containing new remixes of some of Summer's classics, was released in October 2013. "MacArthur Park" was remixed by Laidback Luke for the remix collection; it was also remixed by Ralphi Rosario, which version was released to dance clubs all over America and successfully peaked at No. 1, giving Summer her first posthumous number-one single, and her twentieth number-one on the charts. In the mid-1980s, Summer was embroiled in a controversy. She allegedly had made anti-gay remarks regarding the then-relatively new disease, AIDS. Summer, by this time a born-again Christian, was alleged to have said that AIDS was a punishment from God for the immoral lifestyles of homosexuals. Because of this alleged statement, thousands of her records were returned to her record company and she became the target of a boycott which hurt her career. Some years later, Summer publicly denied that she had ever made any such comment, and in a letter to the AIDS campaign group ACT UP in 1989 said it was "a terrible misunderstanding." In explaining why she did not respond to ACT UP sooner, Summer stated "I was unknowingly protected by those around me from the bad press and hate letters. If I have caused you pain, forgive me." She closed her letter with Bible quotes (from Chapter 13 of 1 Corinthians). Also in 1989, Summer told The Advocate magazine that "a couple of the people I write with are gay, and they have been ever since I met them. What people want to do with their bodies is their personal preference." A couple of years later, she filed a lawsuit against New York magazine when it reprinted the rumors as fact just as she was about to release her album Mistaken Identity in 1991. According to a Biography television program dedicated to Summer in which she participated in 1995, the lawsuit was settled out of court, though neither side was able to divulge any details. Summer was raised in the African Methodist Episcopal Church. Summer married Austrian actor Helmuth Sommer in 1973, and gave birth to their daughter (called Mimi) Natalia Pia Melanie Sommer the same year. They divorced in 1976, but Summer kept the anglicized version of her ex-husband's surname as her stage name. Summer married Brooklyn Dreams singer Bruce Sudano on July 16, 1980. On January 5, 1981, she gave birth to their daughter Brooklyn Sudano, and the next year on August 11, 1982 their daughter Amanda Sudano was born. In Los Angeles, Summer was also one of the founding member of Oasis Church. Summer and her family moved from the Sherman Oaks area of Los Angeles to Nashville, Tennessee, in 1995, where she took time off from show business to focus on painting, a hobby she had begun back in the 1980s. In 1995, Summer's mother died of pancreatic cancer; her father died of natural causes in December 2004. Summer's daughter Brooklyn is an actress, singer and dancer. Summer's third and youngest daughter Amanda is one half of the musical duo Johnnyswim alongside Abner Ramirez. The duo was launched in 2005 and they got married in 2009. Summer died on May 17, 2012, at her home in Naples, Florida, aged 63. She had been diagnosed with lung cancer, which she believed was caused by inhaling toxic fumes and dust after the 9/11 terrorist attacks in New York City. Summer was survived by her husband, Bruce Sudano; her daughters Mimi (with ex-husband Helmut Sommer), Brooklyn Sudano, and Amanda Sudano; her siblings, Ricky Gaines, Linda Gaines Lotman, Mary Ellen Bernard, Dara Bernard, and Jenette Yancey; and son-in-law Rick Dohler. Summer's funeral service was held in Christ Presbyterian Church in Nashville, Tennessee, on the afternoon of May 23, 2012. The exact location and time of the service was kept secret. Several hundred of Summer's friends and relatives appeared at the funeral, according to CNN. The funeral was a private ceremony, and cameras were not allowed inside the church. TMZ obtained a copy of Summer's funeral program, which includes Proverbs 31, dedicated to Summer about a "wife of noble character". According to the program, Pastor Tim Johnson started the service and welcomed the guests. Afterward, Ricky Gaines, Summer's brother, gave a speech. Summer's sisters, Linda Gaines Lotman, Mary Ellen Bernard, Dara Bernard, and Jenette Yancey, performed "We've Come This Far By Faith", and Mary Ellen Bernard performed "Because of Whose You Are". Rick Dohler, a son-in-law of Summer's, gave a speech, and Pastor Johnson spoke again. The service was closed by David Foster and Natalie Grant performing "The Prayer". Guests followed the black hearse with Summer's body to the Harpeth Hills Memory Gardens cemetery in Nashville, where her remains were interred. Other guests included Giorgio Moroder and singer Tony Orlando. Singers and music industry professionals around the world reacted to Summer's death. Gloria Gaynor said she was "deeply saddened" and that Summer was "a fine lady and human being". Liza Minnelli said, "She was a queen, The Queen Of Disco, and we will be dancing to her music forever." She said that her "thoughts and prayers are with her family always." Dolly Parton said, "Donna, like Whitney, was one of the greatest voices ever. I loved her records. She was the disco queen and will remain so. I knew her and found her to be one of the most likable and fun people ever. She will be missed and remembered." Janet Jackson wrote that Summer "changed the world of music with her beautiful voice and incredible talent." Barbra Streisand wrote, "I loved doing the duet with her. She had an amazing voice and was so talented. It's so sad." Quincy Jones wrote that Summer's voice was "the heartbeat and soundtrack of a generation." Aretha Franklin said, "It's so shocking to hear about the passing of Donna Summer. In the 70s, she reigned over the disco era and kept the disco jumping. Who will forget 'Last Dance'? A fine performer and a very nice person." Chaka Khan said, "Donna and I had a friendship for over 30 years. She is one of the few black women I could speak German with and she is one of the few friends I had in this business." Gloria Estefan averred that "It's the end of an era", and posted a photo of herself with Summer. Mary J. Blige tweeted "RIP Donna Summer !!!!!!!! You were truly a game changer !!!" Lenny Kravitz wrote "Rest in peace Donna, You are a pioneer and you have paved the way for so many of us. You transcended race and genre. Respect.. Lenny". Beyoncé penned a personal note: "Donna Summer made music that moved me both emotionally and physically to get up and dance. You could always hear the deep passion in her voice. She was so much more than the queen of disco she became known for, she was an honest and gifted singer with flawless vocal talent. I've always been a huge fan and was honored to sample one of her songs. She touched many generations and will be sadly missed. My love goes out to her family during this difficult time. Love, B". David Foster said, "My wife and I are in shock and truly devastated. Donna changed the face of pop culture forever. There is no doubt that music would sound different today if she had never graced us with her talent. She was a super-diva and a true superstar who never compromised when it came to her career or her family. She always did it with class, dignity, grace and zero attitude. She lived in rare air ... She was the most spectacular, considerate, constant, giving, generous and loving friend of 35 years. I am at a total loss trying to process this tragic news." U.S. President Barack Obama said, "Michelle and I were saddened to hear about the passing of Donna Summer. A five-time Grammy Award winner, Donna truly was the 'Queen of Disco.' Her voice was unforgettable and the music industry has lost a legend far too soon. Our thoughts and prayers go out to Donna's family and her dedicated fans." Summer was honored at the 2012 Billboard Music Awards ceremony. Singer Natasha Bedingfield honored Summer, calling her "a remarkable woman who brought so much light and who inspired many women, including myself, through her music. And if we can remember her through her music, this will never really be the last dance." After her statement, she began to sing the song "Last Dance", Summer's Academy Award-winning song. As she sang the song, photos of Summer were displayed on a screen overhead. Fans paid tribute to Summer by leaving flowers and memorabilia on her star on the Hollywood Walk of Fame. A few days after her death, her album sales increased by 3,277 percent, according to Nielsen SoundScan. Billboard Magazine reported that the week before she died, Summer sold about 1,000 albums. After her death that number increased to 26,000. According to singer Marc Almond, Summer's collaboration with producer Giorgio Moroder "changed the face of music". Summer was the first artist to have three consecutive double albums reach No. 1 on Billboard's album chart: Live and More, Bad Girls and On the Radio: Greatest Hits Volumes I & II. She became a cultural icon and her prominence on the dance charts, for which she was referred to as the Queen of Disco, made her not just one of the defining voices of that era, but also an influence on pop artists from Madonna to Beyoncé. Unlike some other stars of disco who faded as the music became less popular in the early 1980s, Summer was able to grow beyond the genre and segued to a pop-rock sound. She had one of her biggest hits in the 1980s with "She Works Hard For the Money", which became another anthem, this time for women's rights. Summer was the first black woman to be nominated for an MTV Video Music Award. Summer remained a force on the Billboard Dance/Club Play Songs chart throughout her career and notched 19 number one singles. Her last studio album, 2008's Crayons, spun off three No. 1 dance/club hits with "I'm a Fire", "Stamp Your Feet" and "Fame (The Game)". In May 2012, it was announced that "I Feel Love" was included in the list of preserved recordings at the Library of Congress' National Recording Registry. Her Rock and Roll Hall of Fame page listed Summer as "the Diva De Tutte Dive, the first true diva of the modern pop era". ^ Huey, Steve. "Donna Summer Biography". AllMusic. All Media Network. Retrieved 14 April 2016. ^ Graff, Gary (July 23, 2008). "Disco Queen Donna Summer re-Embraces the Spotlight". Reading Eagle. Retrieved February 25, 2014. ^ a b "Obituaries: Donna Summer". The Times. London: News Corporation. 2012. p. 53. ^ Sherman, Catherine (May 21, 2012). "Donna Summer's Lasting (Real Estate) Legacy". Zillow.com. Retrieved April 13, 2013. ^ "President Obama leads Donna Summer tributes". BBC News Online. May 18, 2012. Retrieved May 20, 2012. ^ Carlson, Adam (December 11, 2012). "Public Enemy, Rush, Heart, Donna Summer was inducted into the Rock and Roll Hall of Fame on April 18, 2013". Music-mix.ew.com. Retrieved April 13, 2013. ^ "Greatest of All Time Top Dance Club Artists : Page 1". billboard.com. Retrieved March 21, 2017. ^ a b "Donna Summer". Telegraph. Retrieved August 20, 2014. ^ a b c d "Donna Summer Biography – Facts, Birthday, Life Story". Retrieved May 17, 2012. ^ a b c "The 60-70s". Retrieved May 17, 2012. ^ Badger, Sylvia. "Donna Summer's daughter weds amid flowers, lace". The Baltimore Sun. Retrieved May 26, 2012. ^ a b "Donna Summer". Classicbands.com. Retrieved August 20, 2014. ^ "Billboard Hot 100". Billboard. 11 November 1978. ISSN 0006-2510. ^ "Billboard Hot 100". Billboard. 16 June 1979. ISSN 0006-2510. ^ "The Donna Summer Special". The New York Times. ^ "Donna Summer: too hot to handle". Telegraph. June 13, 2008. Retrieved August 20, 2014. ^ a b Harold Faltermeyer. "Flood Of Memory: The Summer Reign On Sunset Blvd". Retrieved May 13, 2014. ^ St. Mark, David (February 2013). "Brian Grant/Directing A Diva (Donna Summer)". Daeida Magazine. pp. 12–16. ^ "Donna Summer Biography". Rogallery. Retrieved June 13, 2014. ^ Anthony, Carl (11 January 2013). "Reagan's 1985 Big Chill Sunday Inauguration". Carl Anthony Online. ^ St. Mark, David (October 2012). "Harold Faltermeyer Flood of memory: The Summer reign on Sunset Blvd". Daeida.com. pp. 13–28. ^ Grein, Paul (April 16, 1989). "Donna Summer: New Label, New Hit?". Los Angeles Times. Retrieved June 13, 2014. ^ a b "Officialcharts.com". Officialcharts.com. Retrieved August 20, 2014. ^ Telegraph.co.uk Archived July 21, 2015, at the Wayback Machine. ^ Lloyd, Jack (28 July 1990). "The Art Of Donna Summer, On Canvas". The Philadelphia Inquirer. ^ "Find a Star :: The Hollywood Walk of Fame". Hwof.com. Retrieved August 20, 2014. ^ a b "Discussion forum... View Thread". Meetchristians.com. Retrieved August 20, 2014. ^ "About the Performer Donna Summer". Hollywood Bowl. Los Angeles Philharmonic Association. Retrieved 14 April 2016. ^ "Entertainment". Allvoices.com. August 10, 2014. Retrieved August 20, 2014. ^ "Hitman Returns: David Foster & Friends". Great Performances. PBS. Retrieved 12 April 2017. ^ a b "Rock and Roll Hall of Fame Announces 2013 Inductees". Rockhall.com. Rock and Roll Hall of Fame. December 11, 2012. Retrieved December 11, 2012. ^ "iTunes – Music – Love To Love You Donna by Donna Summer". iTunes. October 18, 2013. ^ "Donna Summer's 'Macarthur Park 2013' Remix #1 on Billboard's Dance Club Songs Chart – #AltSounds". Hangout.altsounds.com. December 17, 2013. Retrieved August 20, 2014. ^ "Diva Debacle". NME. October 4, 1999. Retrieved July 17, 2011. ^ Rule, Doug (2010). "Summer Heat". Metro Weekly. Retrieved July 17, 2011. ^ Jones, Steve (2012-05-18). "Donna Summer, Queen of Disco, dies at 63". USA Today. Retrieved 2013-03-22. ^ McCarthy, Tom (2012-05-17). "Donna Summer dies of cancer at 63". The Guardian. Retrieved 2016-07-06. ^ Kinser, Jeremy (2012-05-17). "Donna Summer Denied Making Antigay Remarks That Hurt Her Career". The Advocate. Retrieved 2016-07-06. ^ Company, Johnson Publishing (September 18, 1989). Gay Community Frowns on Disco Diva Donna Summer. Jet. p. 38. Retrieved July 17, 2011. ^ Groover, D.L. (2008). "Summer Fans, Some Are Not". OutSmart magazine. Archived from the original on October 31, 2007. Retrieved July 14, 2008. ^ Burnett, Richard (May 18, 2012). "Donna Summer – The Queen is back – Ottawa XPress". Ottawaxpress.ca. Retrieved August 20, 2014. ^ Ruben Norte (w/prod) (February 9, 1995). "Donna Summer". Biography. Season 8. Episode 15. A&E. ^ A&E Networks (2012). "Donna Summer Biography". "Bio. True Story" (Donna Summer). Biography.com. Retrieved May 22, 2012. ^ Whdh.com Archived November 5, 2013, at the Wayback Machine. ^ "Mosaic Oasis". New York Times. ^ "BBC News – Disco star Donna Summer's funeral held". Bbc.co.uk. May 24, 2012. Retrieved August 20, 2014. ^ Jet 1995, pp. 64. ^ Pareles, Jon (May 17, 2012). "Donna Summer, Queen of Disco Who Transcended the Era, Dies at 63". The New York Times. Retrieved May 18, 2012. ^ James Reed (May 17, 2012). "Boston-bred pop star Donna Summer dies at 63". The Boston Globe. Retrieved May 20, 2012. ^ Hughes, Mark; Hough, Andrew (17 May 2012). "'Queen of Disco' Donna Summer 'thought she became ill after inhaling 9/11 particles'". The Daily Telegraph. ^ a b c d e f g h i j "Donna Summer – The Funeral Program". TMZ.com. May 23, 2012. Retrieved August 20, 2014. ^ a b "Donna Summer laid to rest". BelfastTelegraph.co.uk. May 24, 2012. Retrieved August 20, 2014. ^ Alan Duke (May 24, 2012). "Donna Summer's friends gather for disco queen's funeral". CNN. Retrieved May 25, 2012. ^ a b c d e "Donna Summer's friends gather for disco queen's funeral". CNN. May 24, 2012. ^ Derrick Bryson Taylor (May 23, 2012). "Friends and Family Gather for Donna Summer's Funeral". Essence. Retrieved May 25, 2012. ^ Staff (May 23, 2012). "Donna Summer – The Funeral Program". TMZ. Retrieved May 26, 2012. ^ Jacob Bernstein (May 18, 2012). "Memories of Donna's Disco Nights". The New York Times. Retrieved May 19, 2012. ^ a b c d e f g Sinha-Roy, Piya (May 18, 2012). "Reactions to the death of Donna Summer". Reuters. ^ a b "Celebrities react to the death of Donna Summer". U.S. News & World Report. Associated Press. May 17, 2012. Retrieved May 20, 2012. ^ "Beyoncé Says Goodbye To Donna Summer In Personal Note". RapFix. ^ "Donna Summer's Family Extinguishes Reports That Smoking Caused Disco Queen's Death | E! Online". Ca.eonline.com. Retrieved August 20, 2014. ^ "Statement by the President on the Passing of Donna Summer | The White House". Whitehouse.gov. May 17, 2012. Retrieved August 20, 2014. ^ a b MSNBC Archived May 24, 2012, at the Wayback Machine. ^ Los Angeles Times Archived May 21, 2012, at the Wayback Machine. ^ ABC News Radio (May 14, 2012). "Donna Summer's Album Sales Increase by More than 3,000%". ABC News Radio. Retrieved May 25, 2012. ^ "Digital Spy". Retrieved 20 May 2012. ^ "Donna Summer and the Grateful Dead Added to National Recording Registry". The New York Times. Retrieved August 20, 2014. ^ "Donna Summer Biography". Rockhall.com. Rock and Roll Hall of Fame. Retrieved December 13, 2012. "Donna Summer collected news and commentary". The New York Times. "Donna Summer collected news and commentary". The Guardian.